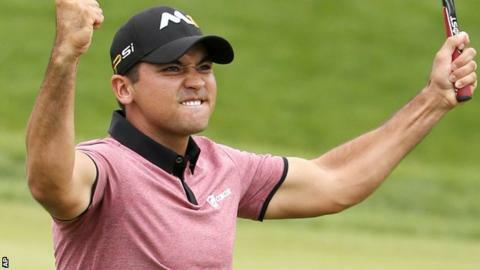 Jason Day moved closer to claiming the world number one spot by opening up a five-shot lead after the second round of the BMW Championship in Chicago. The Australian tied the PGA Tour record by adding an eight-under 63 to his 61 from round one to lead on 18 under par at the halfway stage. Americans Daniel Berger and Brendon Todd are tied for second on 13 under. Jordan Spieth (66) is seven shots back, while world number one Rory McIlroy (65) is nine adrift on nine under. Englishman Justin Rose is a further shot back on eight under after a second-round 64. After heavy rain forced a suspension of the opening round, Day returned to Conway Farms early on Friday needing to hole a 44-yard wedge shot for an eagle that would have given him a 59 and tied another Tour record. However, he hit a low pitch that skidded to a stop 10 feet from the hole and narrowly missed the putt to settle for a 61. Day joked: "I came in this morning and obviously didn't shoot 59 and felt like everyone was disappointed in me. "I don't know how else to explain the way I've been playing. I feel very free, like there's no stress. There's obviously stress, but I'm enjoying it." He is now 97 under par for his last 26 PGA Tour rounds, and will replace Northern Ireland's McIlroy as number one if he wins this tournament. Former world number one Spieth, who won the Masters and US Open earlier this year, said of Day's round: "I feel like I should be paying to come watch some of this. It was special."